ADOPT A PREVIOUSLY LOVED MACHINE TODAY! Why would you consider buying a used machine on Ebay, when you can test drive the machine right here, have a warranty, lessons, and a 1 year trade-up option??? Featured here are previously loved sewing machines we have taken in on trade toward our new machines from Husqvarna Viking, Brother, & Pfaff. 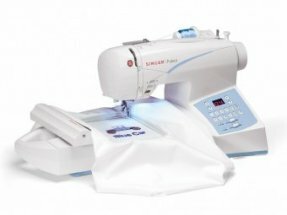 If you're looking for a new machine or an additional machine for your sewing room, you can save thousands of dollars on these wonderful machines! Adoption of one of our Previously Loved Machines includes original accessories, books, etc. unless otherwise indicated. All machines include our 1 Year Bumper-To-Bumper Warranty. In most cases, they also include Owner's Classes. All machines are fully cleaned & serviced before being offered for sale, and are available on a first-come-first-served basis. If you see something you are interested in, I recommend stopping in soon! Deals like these don't stick around long. 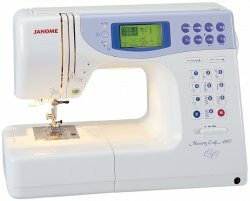 JANOME MEMORY CRAFT 4900QC SEWING & QUILTING MACHINE With a huge library of stitches, strong sewing speed, and great variety of customizing options, it's hard to know where to look first. A good place to start is the large, backlit LCD display. Here you can choose from the 534 built-in stitches across four modes and easily create custom combinations of up to 50 stitches each to save in one of five memory banks. Excellent condition, all accessories included. $599 includes 1 Year Warranty. 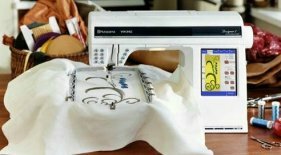 Husqvarna Viking Designer 1 The sewing & embroidery machine that put Husqvarna Viking on the embroidery map, it introduced many world's first fetures, like thread cutting, automated presser foot control, color screen, and much much more. Today it remains a workhorse for sewers of all types. Still embroiders beautifully, well maintained. Includes all original accessories. Basic owner's class included. $699 with 1 year warranty. This machine is an older display model with ZERO hours on it. Has never left the store. 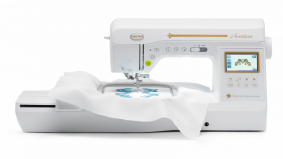 Automatic Needle Threader, Top Drop-in Bobbin, 100 Built-In Stitches. 4-1/2" X 6-3/4" hoop size. Embroidery loaded via usb cable , 120 Built-in designs. NOTE - May not be compatible with WIndows 7,8 & 10. We recommend it as a sewing model only. Original MSRP $1499. Now $400 while it lasts.